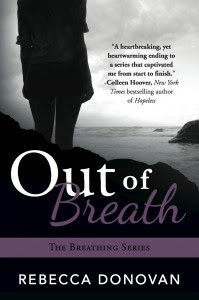 Today is the release of Out of Breath, the third book in the Breathing Series by Rebecca Donovan! "Living in the mistakes of your past isn't going to do anything but destroy your future"
I have absolutely loved this series and have been anxiously waiting for this final instalment, as I think have most YA readers. It seems I have been waiting years. When I opened the book I took a deep breath, mentally prepared myself for an emotional journey and once again Rebecca did not disappoint. This book is emotional, not as angsty as the previous two books, this book is entirely different to the other two. This book is more about Emma rebuilding her life, learning to live, trust, forgive, love and most of all come to peace with herself. This is one hell of a tough journey for her and Rebecca pulls you through it..warts and all. The beginning of the book starts after Emma has moved to University, she is not herself at all, leaving truly was the hardest thing she has ever done and something that will take a long time for her to come to terms with. Her misguided belief that Evan was better off without her totally crippled her mentally and emotionally and she was just a shell of the Emma that we knew. She was a hermit, she never went out, never lived just concentrated on school and reading. Sara was still her closest confidante and even though they were miles apart she was still a constant in Emma's life, it was lovely to see the way that Sara had made friends with Emma's roommates so that she could keep tabs on her best friend. She could not trust Emma to be honest with her so relied on her roommates to tell the truth. Sara truly was an amazing best friend, truly invaluable and a constant to Emma a rock that she couldn't be without. Eventually they manage to start dragging her out to parties, she has a few drinks, she makes mistakes (or not). I did feel for Cole, he was a lovely guy, but he was not right for Emma. Emma soon finds that drinking is another form of escapism and for a short time, turns to the bottle to forget, to feel numb. She soon realises that if she does not stop she will turn into her mother and that is something that she wants to avoid at all costs. Something happens that takes her back home and this is where Emma finally capitulates, she reaches rock bottom and for her the only way is up...will Evan be there to help her pick up the pieces..can he help her rebuild her life, can he forgive her, were they really meant to be or was everything that had gone wrong for them in the past a big fat message with neon lights saying warning warning toxic toxic!!!! Read and find out. I highlighted the hell out of this book in the second half, there are so many quotes that I could put in but I would just end up typing the whole book. This is the reason I love Rebecca's style of writing, the reading is effortless, the writing is fluid, you just get sucked in, like an undercurrent and it pulls you and pulls you until you are finally totally submerged. You don't fight your way out until you cannot take anymore and you either need a coffee or the loo or until you read those dreaded words "the end". I was well and truly sucked in. "Serena called to me. I turned around. "We're going to fix her". A bright smile full of certainty spread across her face before she spun the car around and headed in the opposite direction". "Of course you do," Sara stated, shooting me a look out of the corner of her eye. "She painted the tree in your backyard with the swing you made for her." "Now I had a choice. I could let her push me away, fearing she'd continue to hurt me. Or I could fight for us. Convince her that we were worth it. Any pain she could inflict would never come close to the pain of being without her. I could never give up on her.....on us." "Let me love you. Let me love you enough for the two of us, until you can accept that you're worth it. Because you are, Emma. I don't know how to convince you. But I'll spend the rest of my life trying. You can't give up on me now. I won't let you." "Every breath I breathe is because of you". His eyes flickered, still peering into mine. "Even when you weren't there to save me, you were my reason to breathe. And for that I will always love you. Always". All I can say is that is an amazing way to end the series, I would have liked to have seen more at the end...I am hoping that this actually leaves the door open for Rebecca to write another about this couple, hint hint..how do they fare going forward...what's happens to them after uni, details details that I avidly want to know. "And I chose to live, I chose to love. I chose to breathe". And I chose to read this book. To devour this book. To love this book and I choose to recommend this book, what are you waiting for...read it and I hope that you love it as much as I do.